I’m a little late on this write-up as I was waiting for Louisville to finalize their storm surveys. 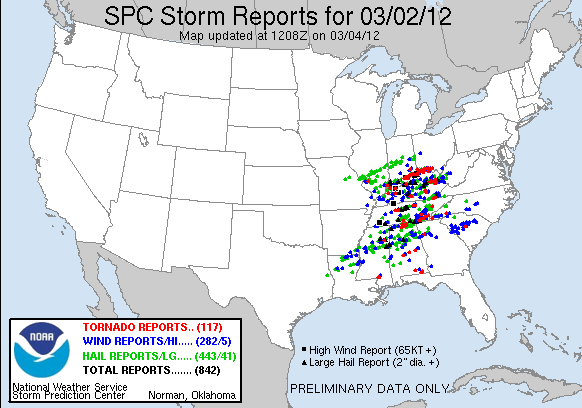 This day had started to crop up as a potentially significant chase day several days prior to the outbreak. One of the model parameters I always check is the SREF sigtor probability and 3 days out it was forecasting 40% for the Paducah, KY area which is a pretty high value on that model. The day before the SPC went moderate risk with a 45% hatched probability of severe weather which was recalling shades of April 27, 2011. 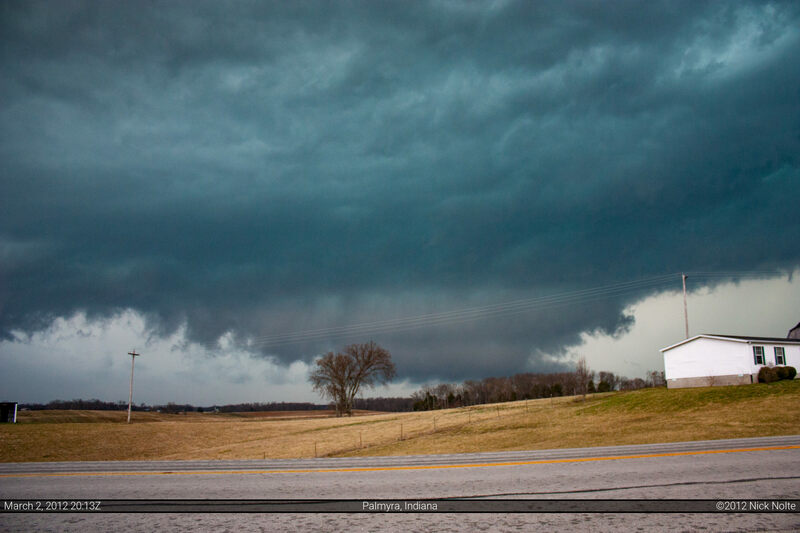 I had committed to chase this day on Wednesday as it was looking like one of those really powerful early spring setups in Dixie Alley, except maybe a bit further north than usual. My original target a couple days out was the Terre Haute to Evansville, Indiana area, but on the day of I shifted east a bit to Louisville, KY. SPC went high risk with the 13z update, which was expected with verbiage mentioning the possibility of long track tornadoes. I left Michigan at around 5:15 in the morning and headed towards my target area of Louisville. I arrived just outside of metro at about 10:30am and meandered west to Corydon where I setup shop in a cul-de-sac at the end of some industrial park. 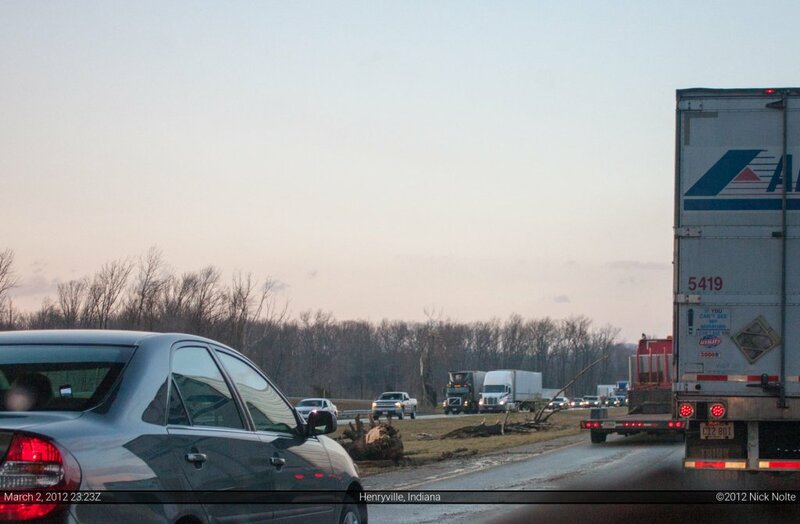 Storms had started to fire west near Evansville and were rapidly progressing to the east at around 60 mph. These storm motions meant it would likely be and intercept day, rather than a chase day. As 20z rolled around, those storms had intensified and were presenting rather impressive hook echo and velocity couplets on radar and I started to move to intercept the storms on a north/south road. At this time, 0-1km storm relative helicities were approaching 600-700 m2/s2 in the area! 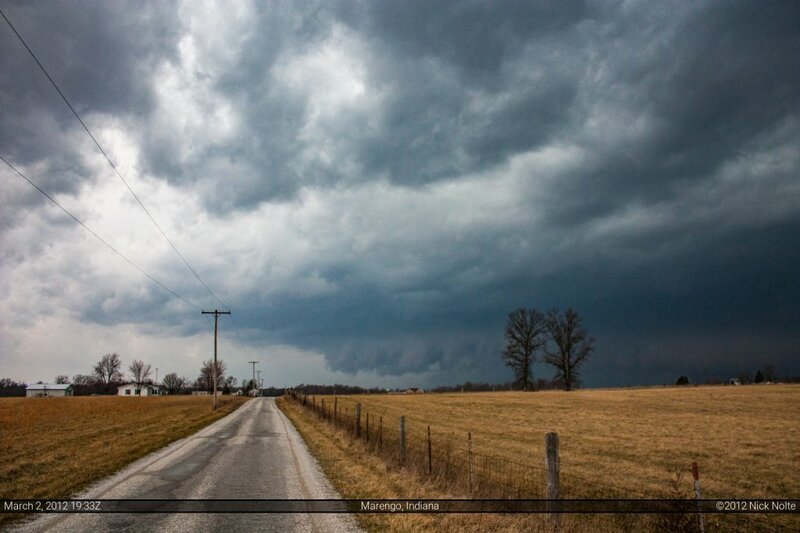 I watched as the first cell approached along a back road and it presented a ragged looking wall cloud that was probably just getting itself organized. Shortly after the photo, I was enveloped in trees and a curvy road. Once I emerged from the undesirable terrain, the feature was no longer there and the storm was just presenting a decent looking wall cloud as it raced off to my east. As I figured I would be unable to catch up to that one as it screamed towards Palmyra, I hung back to intercept the second supercell which was hot on it’s tail. I was able to follow this cell for a mile or two before it, also, raced out of reach. The first storm would eventually go on to drop the Palmyra/Henryville EF-4 tornado just 15 minutes after my photo near Marengo. 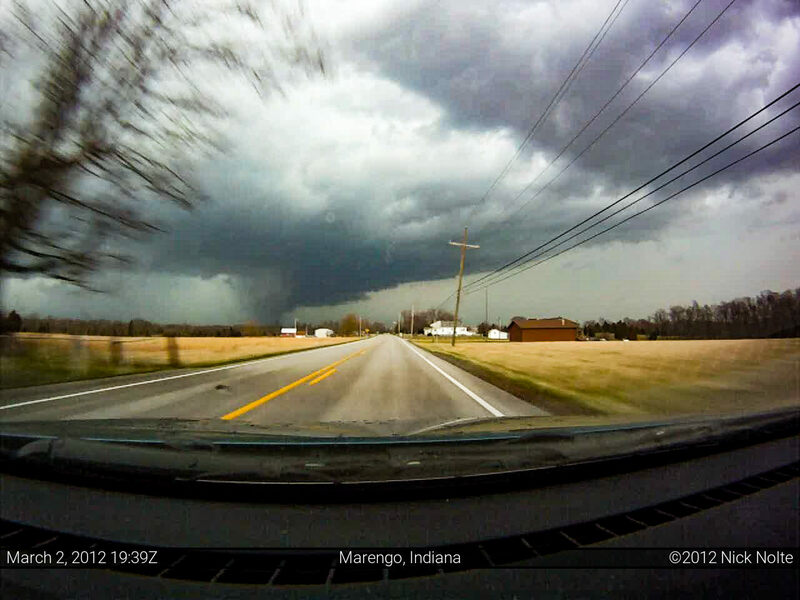 Local storm reports indicated a spotter had reported a funnel cloud 2 miles south of Marengo, which is about where my photo was. 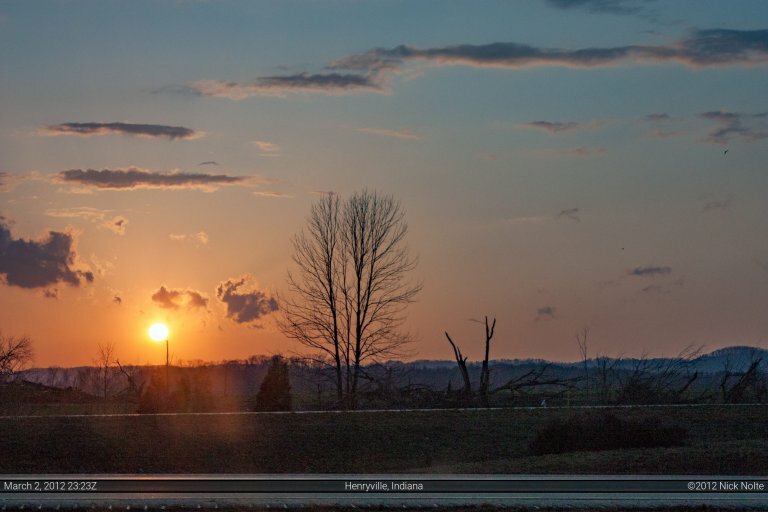 I never crossed a damage path on my way to Palmyra, so either my interesting feature never touched the ground, or it was north of Marengo, therefore never crossing the road. After letting the two cells pass, I headed south to try and intercept one of the cells in Kentucky, but realized that I probably wouldn’t be able to catch it and it was at that point that I called the chase and began the trek back towards Michigan. 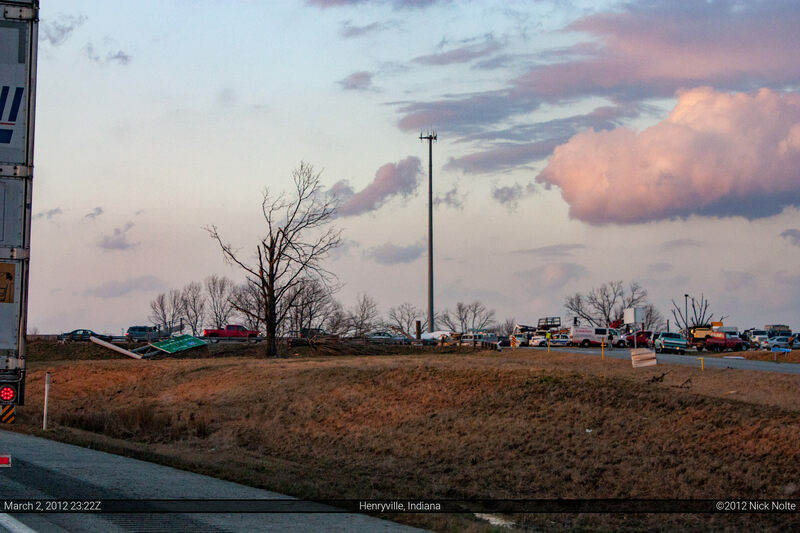 On the way, I encountered the backup on I-65 near Memphis, IN where traffic was at a near standstill while cleanup efforts were underway 5 miles north at the Henryville exit.